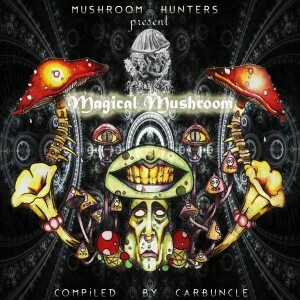 Mushroom Hunters proudly presents their debut compilation, Magical Mushroom! Mushroom Hunters is a crew and netlabel from Kosovo founded in 2010. We seek to promote high-quality electronic music with a focus on night-time psychedelic trance music, particularly deep and mystical forest music. Shamanic poetry by David Baker. Mastered by Stathis Oberon (Space Alchemy Lab) except tracks 4 and 6, mastered by GnOhm. Artwork by Alessandro Cianetti and Witch Freak. MP3 Download | FLAC Download | WAV Download · Download count: 17,251. Thanks again ekto and creators of this art! Congratulations! Great job! Full support from Moon Station Records! lets go pick sm Mushroos…. suppa guys thank u for this awesome work. Slowly and yet playfully. Shivattva prepares for a lift off with some really deranged sound modulation. Perfectly trippy, it begins to kick in slowly and surely. Don’t panic, it is organic – is what comes to my mind now by listening the 2nd minute of Shivattva’s sound craft. The sensations which the depth of this sub base creates here, provide for a very perfect match with the catchy spiraling sound effects, which are bursting our brain synapses. Certainly another hypnotizing recipe that goes in the section ‘’sauce aux champignons’’ . . .to be sincere, I really need to listen in higher sound volume and on the outdoor/open air domain , which I am unfortunately not able to achieve now. It is one of those productions that is just meant to be experienced in nature, as the title itself suggests, not really intended for the home listening I am currently involved with. It sort of reverbs, adds percussions and shifts direction and pace in the last 2 minutes , by reaching its climax and slowing fading off in to the forest. You know, let’s get some fresh air! Re-fresh! It is time to diversify, remodify and rearrange our minds. And I don’t mean anything familiar! I mean the unknown, the mysterious, and the unexplainable. Because that’s why we are here – we are here to explore the miracle, the mystery, the wonder of life; to immerse in the immense beauty of creation, our dreams and imagination, in to the point where reality and imagination come together. It is a production with A Quite dynamic bass line’s effects (a lot of effort put inside of it, certainly, given the progressive build of the tempo and overall sound design, yet persistent and very solid. Smoothly interweaving psilocybin intelligences all the way on the track-perfect acoustics and percussions. I really love this master piece by Kalle Christensen. Super talented Goch sets the channels wide open in this one. Pure psychedelic springs and sparkles forming a pattern of symphonically resonating frequencies! Seems like a belt of scattered sonic particles that are morphing and forming different shapes. It is the end of the 2nd minute and we step into the uncharted and mystical sonic paths. It is this clear sound lucidity that then lights up and ignites the spectrum of this sonic experience. Scattered & focused, concentrated and chaotic. The constant process of keeping the sonic equilibrium going. Bits of melodical bell that sets the pace and tempo very lofty and illuminates the whole forest spectrum. The track begins by a very dark but pretty much enjoyable sort of vibe, interconnected layers of liquid sound which spiral in and out. Accompanied by a very deep sub base, swirly sound effects Very pleasant and highly sophisticated soundwaves that are entangled in a playful and harmonious psymphony of psychedelic frequency modulations. This is a true psychedelic content from the psilocybin forest sounDOmain…really sensational flow of the sonic story filled with psychedelia. It is the micro magics here. Jangaramongara, another talent springing from Japan, drives the frequency here with his bus. It is driving through a wave of high frequencies, tuned 2.0 version and deep sinking sub base, which one instantaneously gets driven into. We are certainly flying with its flow that around the 5th minutes is like stretching the multidimensional sonic boundaries. Amazing flow, rhythmic, dynamic…full of energy and magic!